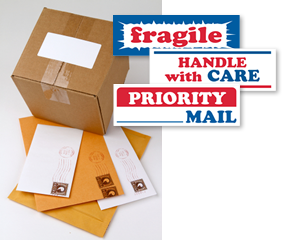 Ensure safe handling of your mail with our envelope labels. Prevent fragile shipments from turning into broken fragments. Place a bright, legible label so everyone knows how to best handle and store your packages. • Premium quality Envelope Labels at the best prices online. • Flexographically printed with color-fast inks for durability. • Backed by permanent acrylic adhesive to keep your mail handling labels in place. • 500 labels on each roll in red, white, and blue. Order and join our happy and satisfied customers. Browse our options below to view detailed prices and features. Questions? Give us a call. We're happy to help you find what you need.